Vegan Margherita Salad — the nineteen sixty. Hello again friends! This week I’m coming at you with my new obsession - my homemade Margherita salad. There is something so perfectly delicious about crisp lettuce, fresh cut tomatoes, red onion, and basil - more specifically, pesto basil! Seriously I am so obsessed that my mom found a pesto basil plant at the farmer’s market this season because now we have so much growing in our garden which means I have been putting it on everything. Yes, everything. It has so much flavor and has actually replaced dressing on my salads and is my new go to topping for steamed potatoes, sliced tomatoes, and any other fresh vegetables I’m eating! 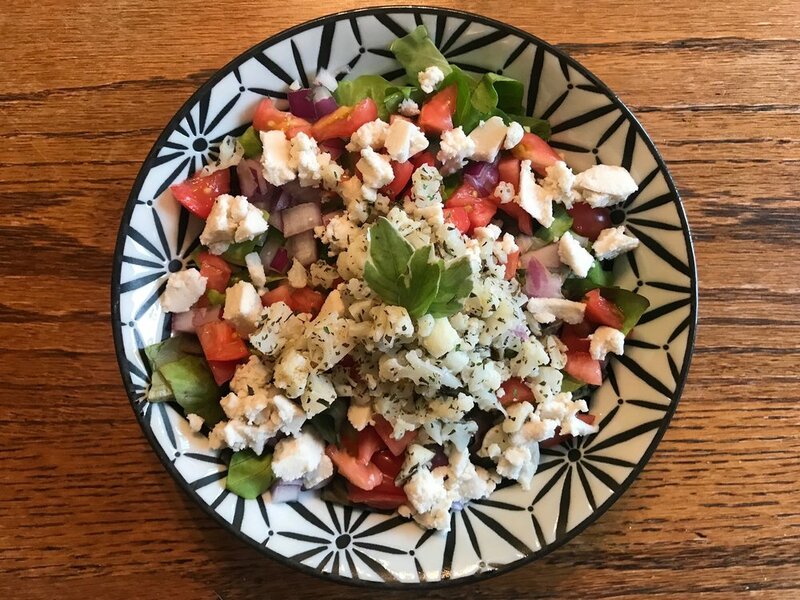 This salad is so easy to make and doesn’t take many ingredients so you will probably want to make this a staple in your life. Just saying. I, of course as always, will be using organic produce and home grown produce when available so fill in with whatever you have that is most comparable and I promise you this will be the most delicious salad you’ve ever had! It is important that you use the Miyoko’s cheese because I can’t guarantee other brands will be as delicious as Miyoko’s. This isn’t sponsored - I just love their vegan products! After washing your cauliflower, cut it into florets and put in a pan filled with water. Put on your stove top and bring to a boil. Boil the florets for about ten minutes until they are fork tender. Once cauliflower is cooked, drain and let cool. When it is cool enough to touch chop the florets into tiny pieces and mix in a bowl with the dried herbs and spices. Toss it until the cauliflower is completely covered. While the cauliflower is resting, chop your lettuce and dice the tomato, onion, and vegan mozzarella. Chop your pesto basil as well and set to the side. If you’re using pita bread, you can set it in the oven now if you wish it to be a little warm. Find your favorite salad bowl and fill it with your lettuce. Put your cauliflower, mozzarella, tomato, and onion on top. Finish by sprinkling the pesto basil on top. Add salt and pepper to taste as well as sprinkling croutons if desired. Enjoy! This is seriously one of my favorite salads ever because it brings together so many different flavors and textures. It really fills you up and makes you feel satisfied. I don’t usually use croutons or pita bread but I thought either one would make a wonderful addition to the salad. You can also make this without the vegan mozzarella or add your own vinaigrette to give more flavors.